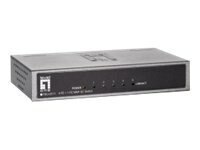 LevelOne FEU-0511 is 4-port 10/100 Mbps + 1 100BaseFX Fast Ethernet switch that is designed for small or medium network environment to strengthen its network connection. This product is compact in size, making it ideal for SMB users with limited space. It is a superb choice for expanding your network.